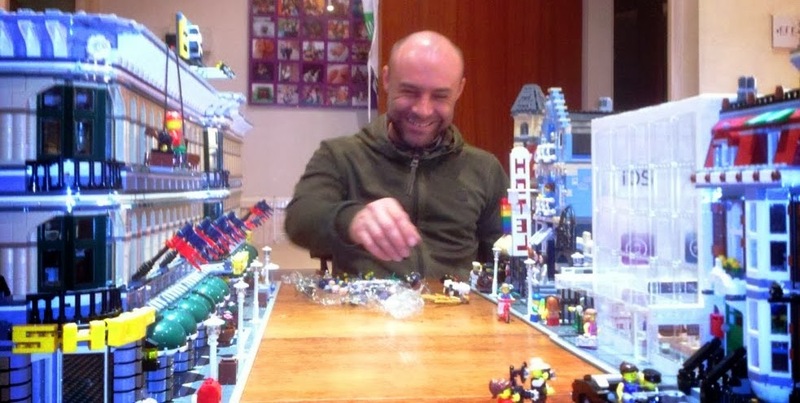 A few weeks ago I was introduced to a lovely LEGO fan named Brett by a mutual friend. As you do we then swapped LEGO photo's until 1.30am and got on like a house on fire. Some of his stuff was absolutely amazing, and I couldn't help but think it was way too cool to be hidden away. 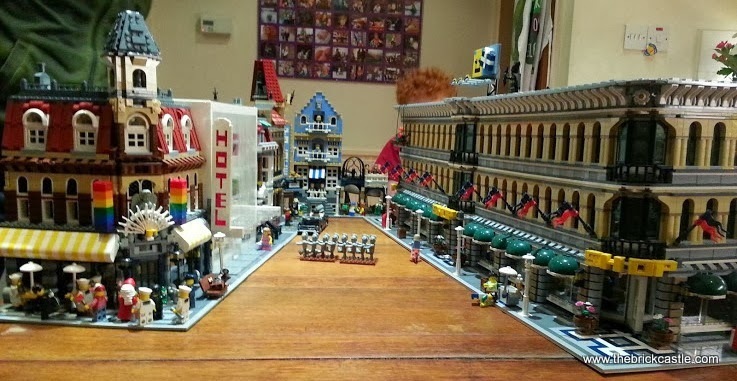 Last week he came round with 'a few bits' - luckily for us that turned out to be an entire modular house street, including a modified Emporium and his own Apple Shop. 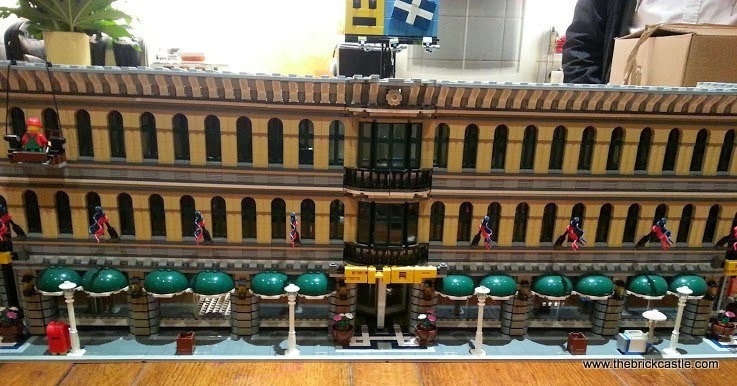 The Grand Emporium set 10211 is a big LEGO set with 2182 pieces, a 3 storey department store which lives on a corner. 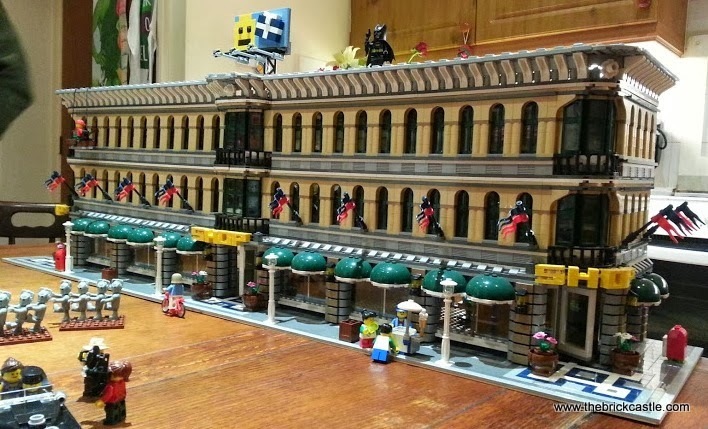 Brett didn't feel it was grand enough, so he has put together 4 Emporium sets into one immense build. I'd heard about it and seen a photo, but watching him unpack it was really something else. The different floors come apart, and he's designed it so that it separates easily in the middle, so in fact it travelled in 6 sections. The original has only one escalator, but you can't go up without coming back down, so his modification includes 2 escalators to each floor. 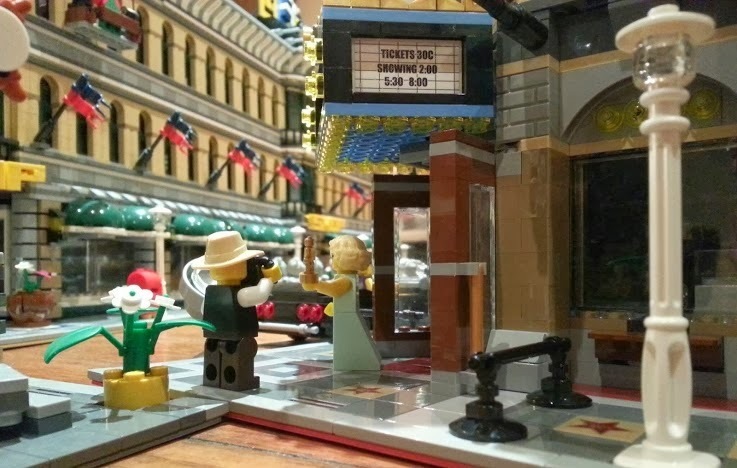 The original Emporium set appears at either end of the build. Part of the Modular Buildings series, and designed to be an end corner building. 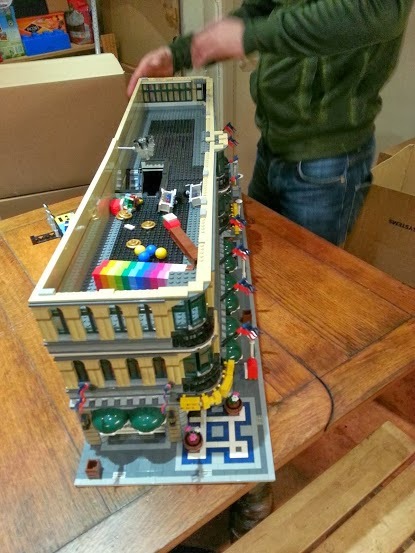 His build doesn't use all of the 4 sets, but it still has around 7000 bricks standing on 4 x 32 stud baseplates. It's an incredibly impressive piece - so large in fact, that I completely failed to get a straight on photo of the whole thing! 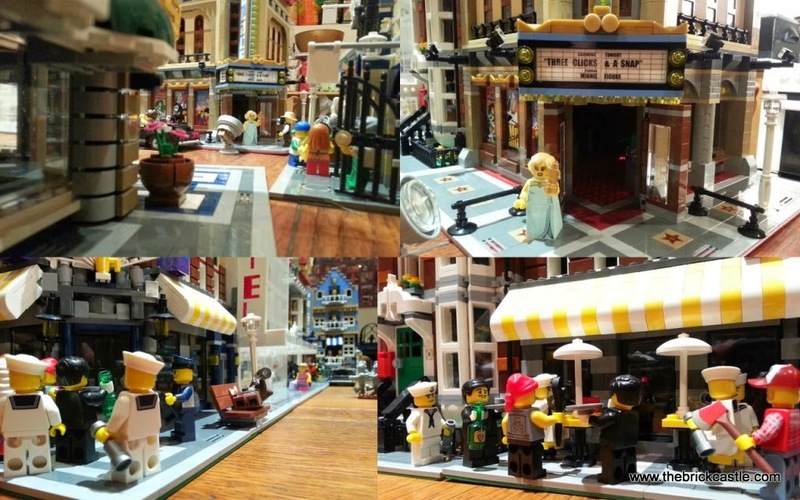 He has a host of the modular buildings - including the Palace Cinema 10232 and the Cafe Corner 10182, which he has populated in his own very unique style. 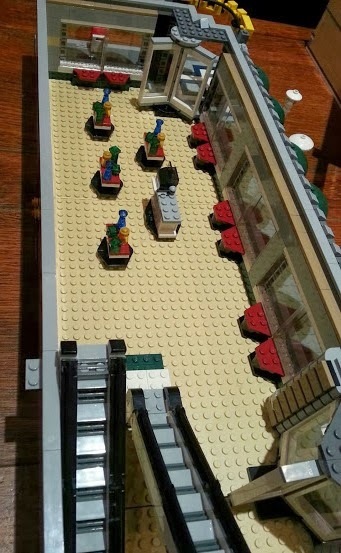 Brett also has a love of Dr Who, as the Character Options figures appear on his Market Street 10190 building - much to the delight of my little boys, who were never far away throughout....pocket check each time they tried to leave the kitchen! 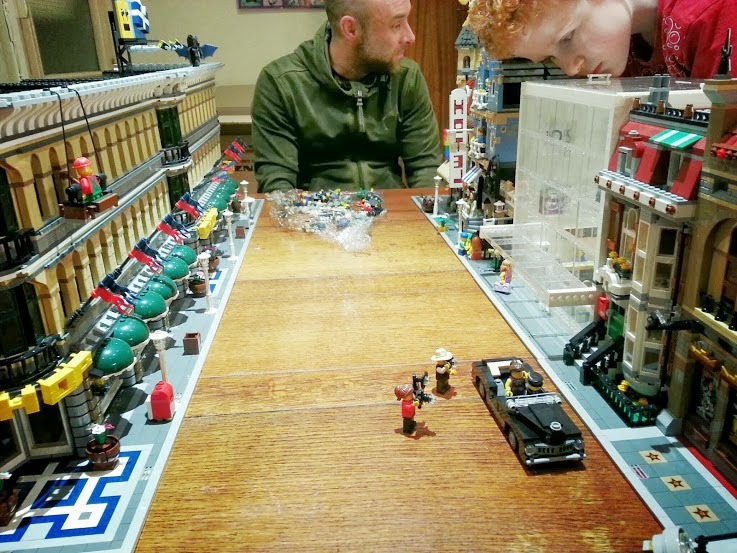 Having such a huge street scene on the table was truly amazing, when you get down to minifigure level everything takes on a whole new outlook and you really can immerse yourself into the LEGO. It's something you dream about when you're a child, at least, I certainly did when I was building my 8 brick high buildings with half a roof! However the buildings are laid out, the dominant feature in the middle of the street opposite the emporium was always the Apple Shop. 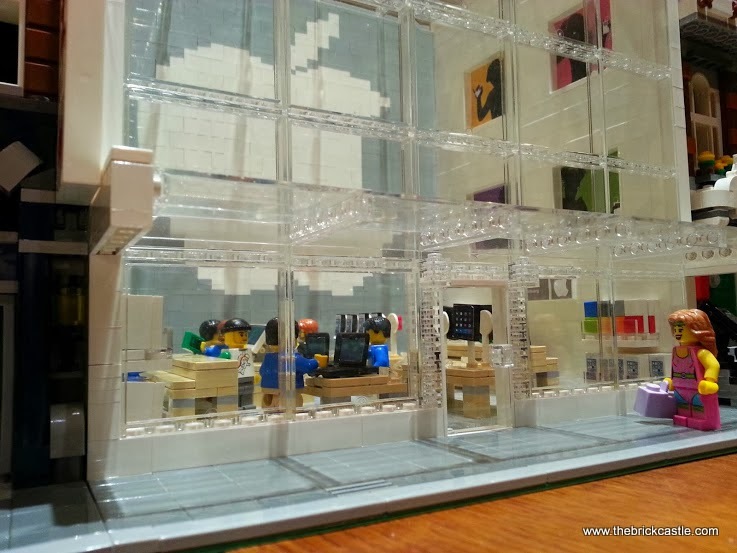 Brett designed the Apple Shop from scratch himself using the LEGO Digital Designer and bought all of the necessary bricks through the LEGO shop pick-a-brick and then through Bricklink - a fantastic resource if you lose parts or want to make yourself something you can't readily buy the parts for. 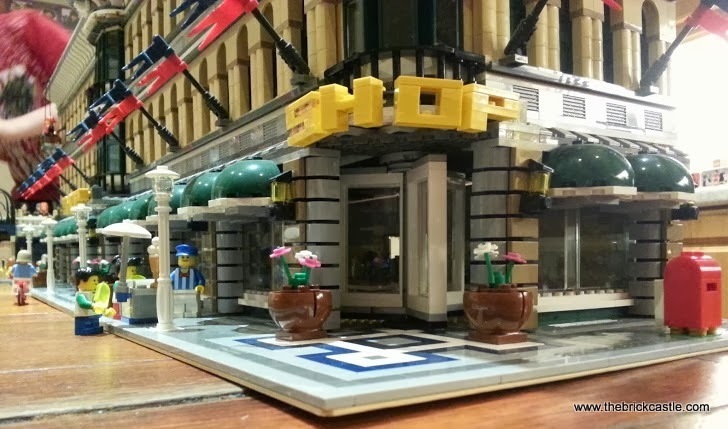 Bricks are bought and sold in a marketplace with starting prices around 2p for common small elements. In total the build cost around £150, which is actually a fairly standard price for a build of this size, although it contains less actual elements than you'd usually find because it has so many large pieces. It truly is a really imposing building. The laptops and other items in the shop are fantastic, it's incredibly hard to get all of the detail into one blog post. The 6630 Bucket Loader and 6631 Steam Shovel bought for me by my Grandparents. 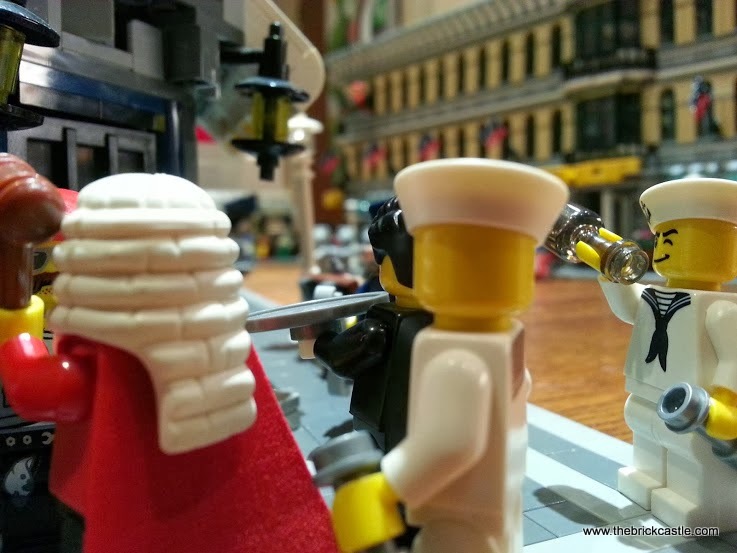 What are your biggest childhood memories of LEGO? What was the first set you modified? The 6605 Road Racer or the 6824 Space Dart which I changed from a rocket to a launch pad. 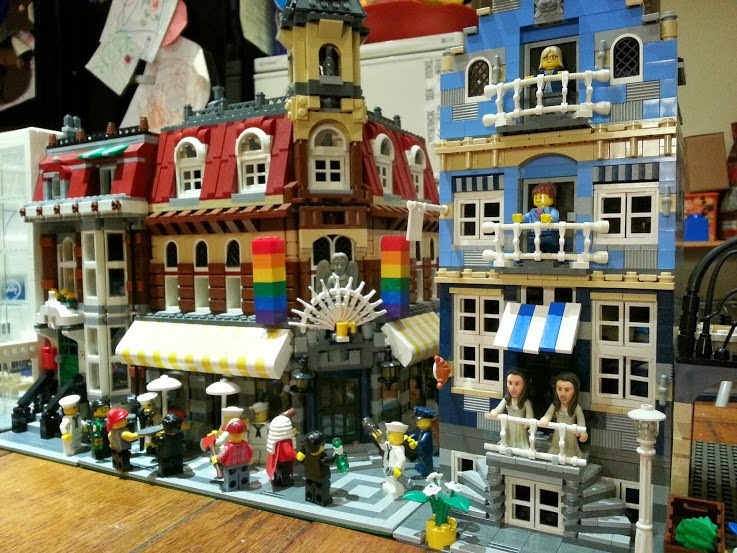 When you came back to LEGO as an adult after the dark ages, what was the first set you bought? When I was at University I bought the 8880 Super Car, then the 8480 Space Shuttle and then I got the 5600 Radio Control Racer because it was a proper remote control car and I could sit on the sofa and drive it about the room passing stuff to my housemates. 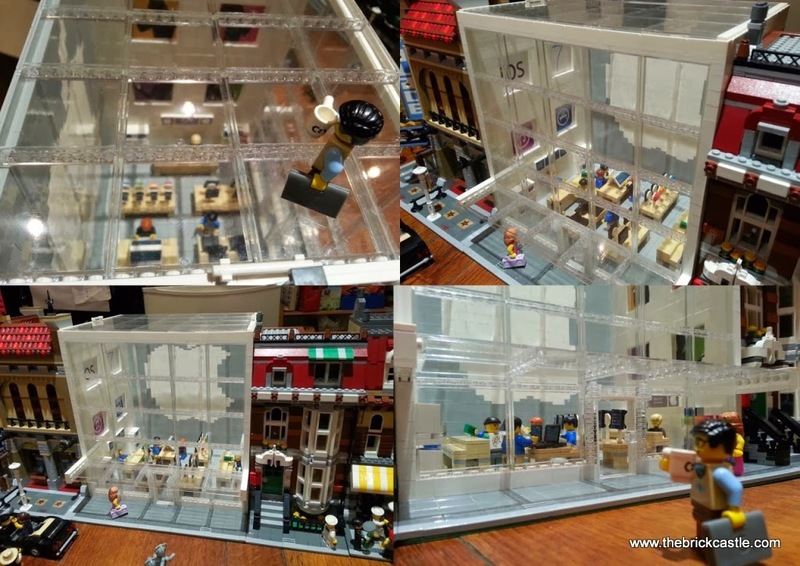 834 different sets and minifigures. In total 2094 minifigures. Are you Emmet or Lord Business? Both - one on either side of my head. 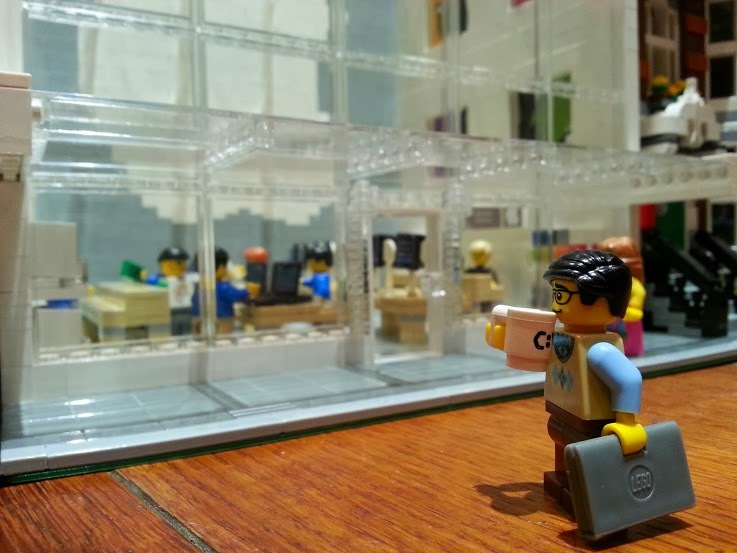 Tell us something great about you and LEGO? I bought my God-Daughter her first LEGO set, the 3177 Small Car. I bought two, so that when she's an adult I can give her the second one, because it would be brilliant if tomorrow someone gave you the exact same set you'd owned first as a child. You can find Brett on Brickset - he's under the username Brett, if you message him, he will reply eventually! That is absolutely awesome!! I wish I could have been there to see it. 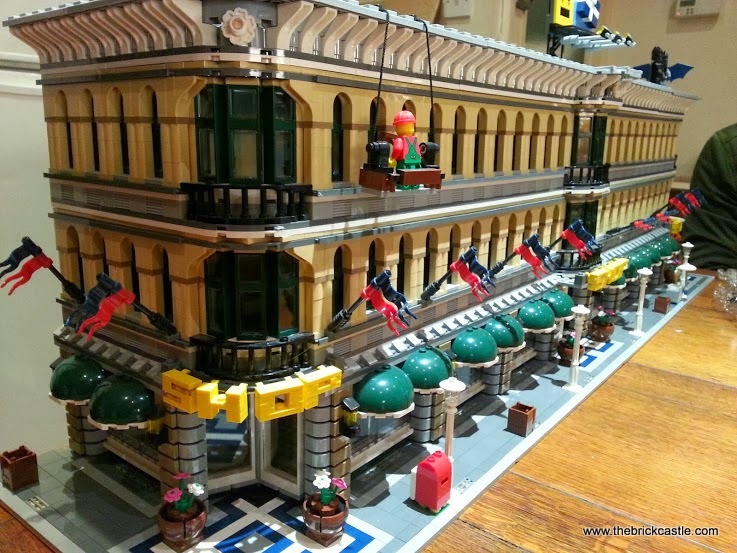 Love the emporium and the other buildings too - it's just so fantastic, very inspiring as to what you can achieve from Lego. He sounds awesome. I love what he did for his Goddaughter, that's a genius idea! That is incredible and it must be his real passion. Its so nice to see adults who still love the sets and I agree we should all have a second first set, for when we are older. That is totally amazing, the scale of it. Where does he keep it all?? Love it. It is stunning, I couldn't take my eyes off it! 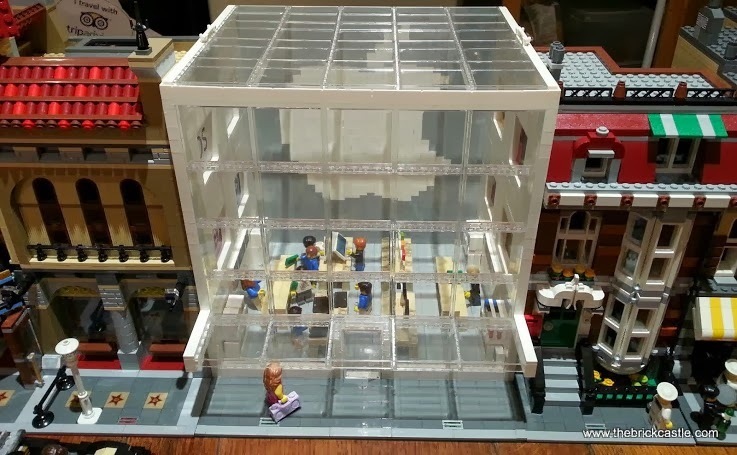 wow this is amazing lego is a fantastic toy from young to old I grew up with it and now buying it for my grandchildren. 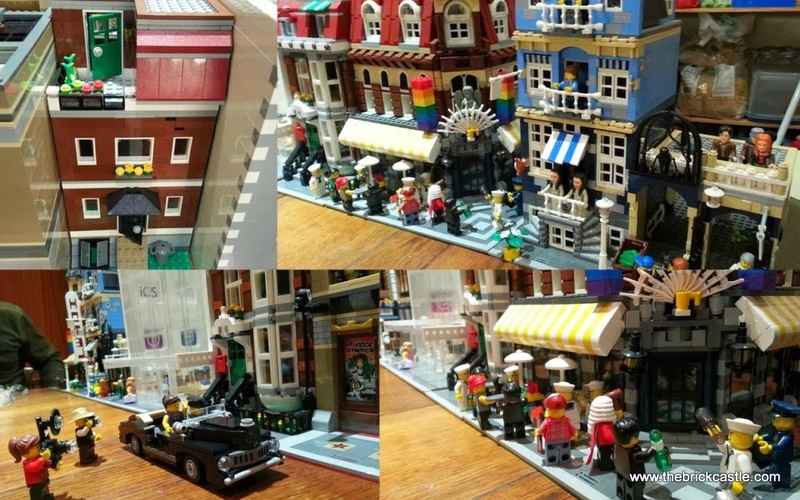 Does anyone know if it's possible to hire these big street scenes for a LEGO themed event?